Thirteen year old Dylan Redwine isn’t a runaway, his mother Elaine Redwine insisted late Friday afternoon, Nov. 23. She said Dylan’s father Mark Redwine said he last saw his son at around 7:30 a.m. Monday, Nov. 19, noticed he wasn’t around at around 11 a.m., and reported him missing at around 4:30 p.m. that day. Mark Redwine lives at the north end of County Road 500 at Vallecito. IGNACIO – The mother of a 13-year-old boy, whom authorities have been searching for since he disappeared Monday around Vallecito, is convinced he didn’t vanish on his own volition. Dylan’s brother, Cory, 21, and Elaine Redwine’s significant other, Mike Hall, searched a ridge above Vallecito Reservoir on the off chance that Dylan ended up there. LA PLATA COUNTY - Dylan Redwine, 13, has been missing since Monday. Volunteers have been going door-to-door, searching for Dylan. Dylan's father, Mark, reported him missing. Dylan was staying at his father's home in Vallecito - about 22 miles northeast of Durango - since Sunday as part of a court-ordered Thanksgiving holiday visitation. Mark said Dylan was at his house on County Road 500 when he left to do some errands around 7:30 a.m. Monday. Mark said Dylan was gone when he returned around 11:30 a.m.
"We have not ruled out any possibility" Dan Bender, Public Information Officer for La Plata Sheriff's Office, said. "This is the fifth day Dylan has been missing with few clues to work from. We have to consider everything from foul play to a runaway. We hope the broadened exposure to the public through the news media, the work of our investigators, and the national reach offered by the FBI and National Center For Missing and Exploited Children will result in a positive conclusion with Dylan reunited with his family." La Plata County Search and Rescue searched for Dylan Monday night and all day Tuesday. A resident who knows Dylan reported seeing him walking along County Road 501 in Vallecito on Monday afternoon before they knew he was missing. Dylan is described as 5 feet tall, 105 pounds, blond hair, blue eyes with a fair complexion. He was last seen wearing a blue and white Duke Blue Devils baseball cap, a black Nike T-shirt, black basketball shorts, black Jordan tennis shoes and a black backpack. Anyone who may have information on Dylan's whereabouts are asked to contact La Plata County Sheriff's Office investigators at 970-382-7015 or 970-382-7045. There is something to the fact that Dylan wanted no part of going to his father's home for Thanksgiving visitation. It was a court appointed visitation. However, according to a Vallecito resident, he saw Dylan walking with another boy Monday afternoon. It almost seems like Dylan wanted to get away from dad, but then something bad may have happened after that. Dylan’s father told investigators Dylan was at his house on County Road 500 when he left to do some errands at about 7:30 Monday morning. Mark said Dylan was gone when he returned to the house at about 11:30 a.m.
Mark reported Dylan as missing a little before 5 p.m. Monday after he was unable to find him during the afternoon. I don't know if you can see this and I know your not a big reader so I will keep this short. We are all in Durango looking for you. I AM HERE and I will never give up looking for you. You are my ray of sunshine and the best kid a mother could ever have. I miss your laugh and your smile so much. We will find you and bring you home with us! We all love you so much son and hope you are safe. You are the glue in our family so come home and stick us back together! We love and miss you immensely and will never stop searching for you. Don't give up on us son we will NEVER give up on you. and Big Brother and Mike! It looks to me like Dylan has several FB pages, this is one of them. Just me thinking here, but I find it odd that the dad picks him up Sunday night and then leaves him at 7:30 am the next morning to run errands for four hours? If Dylan wasn't happy about going to his dad's house surely his dad knew that too. I can't see myself leaving a 13 year old that wasn't happy about being there home alone for four hours...that's just me. There's no mention of him calling to check on him or anything that I've seen. Then when he said he returned home at 11:30 am and Dylan's not there he doesn't report him missing for another almost 6 hours? His mom said the last time anyone she knew talked to him was Sunday night and he was supposed to meet up with a friend on Monday. Did his dad know that? If so, why didn't he take him to the friends house? If I understand what I've read correctly, the friend that he planned to see on Monday lives in Bayfield, which according to Google maps could be anywhere from 13-21 miles depending on where he was actually going...that's definitely not a reasonable or safe walking distance imo! La Plata County Sheriff’s Office spokesman Dan Bender said Mark Redwine told investigators that he saw his son Monday about 7:30 a.m. but that the boy was gone when he returned about 11:30 a.m., after running errands. A message left on Mark Redwine’s cellphone Friday was not returned. Dylan didn’t like the remoteness of Vallecito, his mother said. He was oriented to Bayfield, where he had gone to school until this fall and where he had friends, she said. Redwine believes her son’s disappearance was involuntary. “Someone knows where he is,” she said. Pete will you continue to share this in your area. This in one of Wesley's friends and he disappeared possibly trying to get into Bayfield to see Wesley's buddy and the boys. She continued, “If he could call, he would.” His cell phone and charger and various other items were in his backpack, which he supposedly had with him. It’s not at his father’s house, she said. She said she and Dylan had moved from near Bayfield to Colorado Springs on July 1 this year. He was in eighth grade there and was happy and had a lot of friends there, she said. She said she was awarded sole custody of Dylan on Sept. 21. Previously she and Mark Redwine had shared custody. On Nov. 18, Dylan flew here for his first visit with his father since that court decision, Elaine said. Dylan texted her Sunday evening to let her know he had arrived and his father had picked him up, she said. That was the last she heard from him, and his phone hasn’t been used since around 8 p.m. Sunday. She was skeptical of a report that someone at Vallecito saw two boys walking along CR 501 Monday at around 2 p.m., that one of them had a backpack. “The Sheriff’s Office is trying to substantiate that, because he didn’t spend that much time at Vallecito,” she said. “We lived off CR 223 for about eight years,” she said, and his friends were from Bayfield, not Vallecito. The sheriff's office has been contacting those friends, she said. BAYFIELD, Colo. - Volunteers today are searching three more areas for a missing teenager. 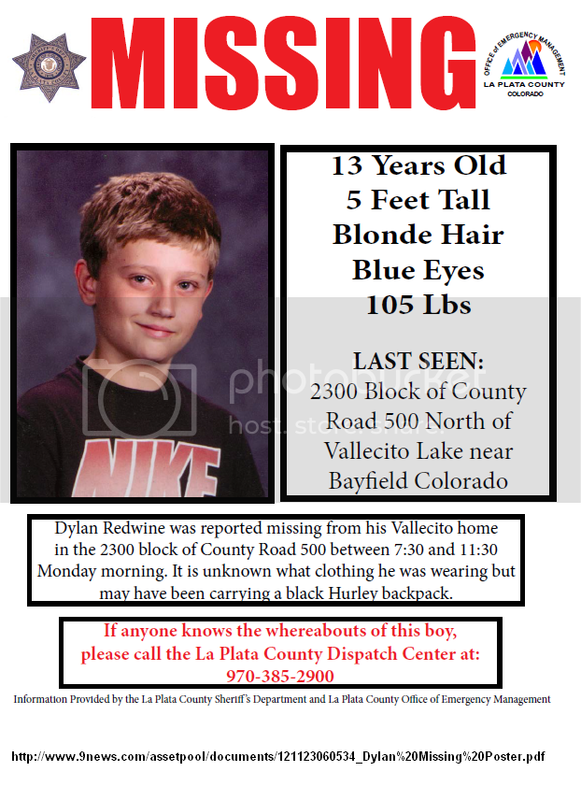 Dylan Redwine, 13, disappeared last Monday from his father's home in Vallecito, near Durango. "We are meeting on Sunday, November 25 at 10 a.m. to continue searching the area and spreading awareness that we are missing a child from our community," said a post on the Find Missing Dylan Redwine Facebook page. The group plans to search in the areas of Forest Lakes, County Road 502 and County Road 501 from Bayfield to Vallecito. Dylan had been at his father's house in Vallecito, about 22 miles northeast of Durango, Colorado, for one day when he disappeared. 6th Judicial District Judge David Dickinson had issued a court order granting his father visitation rights during the Thanksgiving holiday, sheriff's officials said. Dylan and his mother Elaine and brother Cory moved to Colorado Springs last summer but they are originally from the Bayfield area, about 25 miles from where Dylan went missing. Five investigators from La Plata Sheriff’s Office are assigned to the case. Deputies and officers from other law enforcement agencies said they are responding to any report of a young person resembling Dylan. "We have not ruled out any possibility" said Dan Bender, Public Information Officer for La Plata Sheriff’s Office. "We have to consider everything from foul play to a runaway. We hope the broadened exposure to the public through the news media, the work of our investigators, and the national reach offered by the FBI and National Center For Missing and Exploited Children will result in a positive conclusion with Dylan reunited with his family." Ryan Nava, 13, tapes a flier of Dylan Redwine, who has been missing since Monday, on a sign on County Road 502 in Bayfield. Ryan, Fernando Stubbs, 14, center, and LWesley Herring, 15, all of whom are friends with Dylan, went door to door Saturday asking residents if they’ve seen Dylan. The boy was first reported missing Monday, after arriving at his father’s home in Vallecito from his mother’s home in Colorado Springs. Dylan was in Vallecito for a court-ordered Thanksgiving visit with his father, Mark Redwine, Bender said. Mark Redwine and Dylan’s mother, Elaine Redwine, divorced in 2007. Ryan Nava, 13, a friend of Dylan’s said in a phone interview Saturday that Dylan was originally going to Bayfield to visit his friends Sunday night but then changed that to meet them at 6:30 a.m. Monday. Ryan said he and his friends expected Dylan’s father to drive him into town from Vallecito, but Dylan never arrived. Mark Redwine showed up later asking where Dylan was but the three friends didn’t know. Ryan said he texted and called Dylan’s phone all day but didn’t get replies. “We asked (residents) about any sheds or barns where he could take shelter,” Fernando said. Volunteers talking to people in cars about Dylan! What a great, compassionate, hard working community we have! And wide spread too - From all over the Four Corners people are working to raise awareness and the family is grateful! Search efforts on the Lake, have turned up 4 human sents by dogs, and there is now a NM dive team in the water! Praying Dylan is safe, and that this gives us clear answers that he is not there. As of 10:30 AM search dogs were brought out onto the Lake and they found four locations where they picked up what appears to be human scent. the sheriff i spoke with, who Has been on the force for 34 years says that he has never had to deal with a situation like this involving a missing teen where they can't find any clues. New Mexico dive team is about to enter the lake within the next hour or two. Search teams on Lake Vallecito looking for Dylan Redwine.